PAINTSVILLE, KY. — On Wednesday night the Lawrence Co. Lady Dawgs ( 12-5 ) defeated Johnson Central ( 10-10 ) for the first time since 2012 with a 57-54 nail biter on the road. 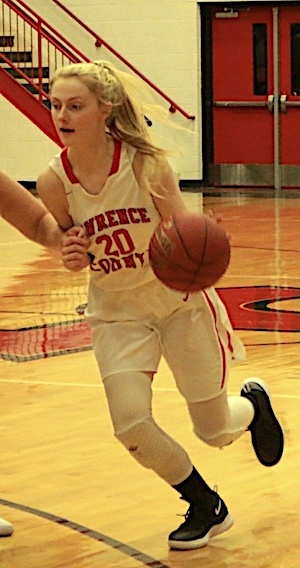 Brooke Neal had 8 points in a victory over Johnson Central on Wednesday. The Lady Dawgs were led by Kensley Feltner with 16 points and 6 rebounds, Lexi Ratliff tallied 13 points and 5 boards, Kylie Maynard 9 points, Brooke Neal 8 points, Kelly Davis 7 points and team leading 9 rebounds, Ellie Webb chipped in with 4 points. LCHS hit 3 three pointers and went 14-18 from the foul line. The Lady Dawgs will return to action tonight at 6:00 against District foe Floyd Central in the first game of Girl/Boy Double Header.